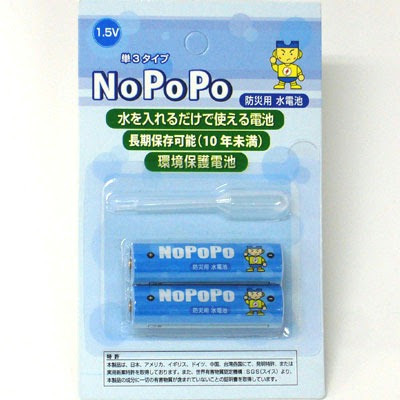 Here is a great new product out in Japan and hopefully available to the rest of the world soon. In February Water Powered battery where in the testing phase in Japan. Now it would seem they have made it to the store for the Japanese to buy and use. 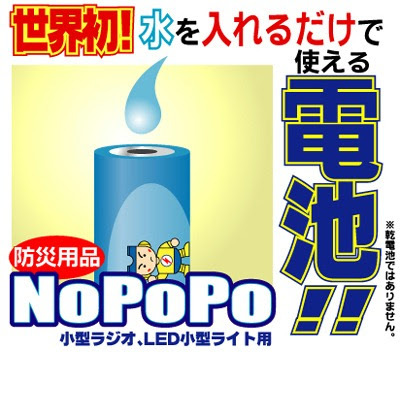 NoPoPo (Non-Pollution Power) Aqua Batteries are available in both AA and AAA form, although the company page shows they are producing the technology for all sizes of battery, and can only be currently purchased in Japan. The batteries can be recharged with various different fluids using the new development which forms electric power using liquid as a catalyst. The basic principle is that a mixture of magnesium and carbon reacts when mixed with a liquid to produce, in the case of the AA battery, up to 500 milliamp-hours (mAh) of life. Each time the battery is recharged it has a lower power level than the time before and the life cycle allows for about 3 to 5 recharges before disposing of the battery. Each battery can potentially keep its charge for up to 10 years which could be great for many life saving devices in remote locations. Since the battery does not contain mercury and other harmful materials, it can be easily disposed of without worry for the environment. Amazing batteries! I've never seen one of these in my whole life. Where can I order one of these, is this better than eveready? And by the way its cute.